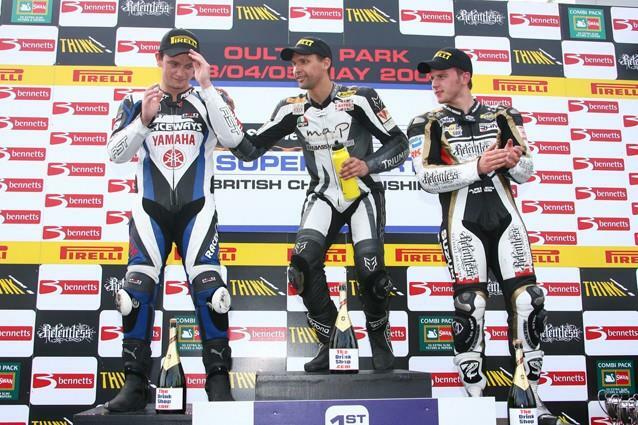 Veteran rider Glen Richards has taken a thrilling first victory for Triumph on the 675 at Oulton Park in the British Supersport race as the Triumph man battled hard with Raceway Yamaha’s Hudson Kennaugh. The victory has taken Richards to the top of the championship placings after his win in the re-started race while Ian Lowry took the final podium spot on his Relentless Suzuki. Two riders crashed off on the warm-up lap, one managed to get going, but David Hallett was not so lucky. Chris Martin on the Gearlink Kawsaki went into the lead with Hudson Kennaugh behind him. But Glen Richards shot into second place on the Triumph half way round the first lap. Matthew Whitman crashed off at Cascades on lap two and two laps later Alan O’Connor had a massive crash at Druids which brought out the red flags two laps later. O'Connor was unconscious at the scene of his crash, but he was taken to hospital and is now said to be recovering and is conscious again. The re-start saw the grid formed as it was at the end of lap two with Chris Martin on pole once again. Glen Richards put his Triumph into the lead from the start, but South African Hudson Kennaugh soon passed him. Conor O’Brien crashed off at Lodge, while Aaron Walker seemed unhappy with Isle of Man TT hero John McGuinness as the pair came off at Shell, while Marty Nutt was the next rider off on lap three. Ian Lowry made a move on Chris Martin to take third on his Relentless Suzuki on lap five, as Hudson Kennaugh began to build up a half a second lead on Glen Richards. Glen Richards set the fastest lap with a 1:39.619 on lap eight on his Triumph 675. HM Plant Honda’s Steve Brogan was on a charge, having made an impressive move on Craig Fitzpatrick, he then took Daniel Cooper and BJ Toal by the end of lap nine. Glen Richards was also closing the gap on Kennaugh and had brought his lead down to 0.19secs. And on the final lap Richards went for his move with he and Kennaugh swapping leads on almost every corner as the pressure was on for the victory. And coming into the final corner veteran Richards made his final dive for success and with it grabbed the victory by just 0.29secs from Kennaugh while Ian Lowry took the final podium spot. Series leader going into the Oulton Park race, Steve Brogan came home fifth on the HM Plant Honda. But Glen Richards’ victory took him to the head of the table.